Etchings Press: How would you classify your writing style/method? Danny Caine: In terms of style, I’m very interested in approximating spoken language. I think you see this in poems like “The Language We Grieve in is Trays” or the call and response stuff in poems like “Seder Checklist.” I do this in part because a lot of the poets I love, like Frank O’Hara, are often considered “talky.” But also this project in particular mimics a fairly raucous Seder, so echoing a polyphony of speech makes thematic sense. EP: What other kinds of writing do you generally do? DC: I’m primarily a poet, and the vast majority of what I write is poetry. I do write book reviews, too, and I occasionally publish them on The Los Angeles Review’s website. I also work at Raven Book Store in Lawrence, and I’ve written dozens and dozens of shelf tags about books I love. EP: What would you like any story you read to accomplish? EP: What inspired you to write Uncle Harold’s…? DC: I was visiting the Heinen’s at Cedar and Green Road—it’s a nice grocery store in a Cleveland Neighborhood that has a lot of Jewish residents. Their Passover section was absolutely stocked with just the craziest stuff—milk chocolate lollycones, for instance. Passover junk food had always been present at my family Seders, but standing in front of that display I realized the cognitive dissonance was pretty funny—we’re supposed to be eating Bread of Affliction. Does it really count as a bread of affliction if it’s a milk chocolate lollycone? That day I wrote “The Inflatable Matzoh Ball of Affliction,” and everything else followed over years of reflection and thinking about how family and Passover intersect. I’m sure we’re not alone in having a bag of toys to represent the ten plagues. EP: What makes Etchings Press a good fit for your work? DC: I loved that you asked for work from or dealing with this part of the Midwest. I don’t see a lot of poetry that reflects the Midwest landscape I know. It’s getting better as places like Minneapolis become literary centers instead of just good ole’ New York. But there’s still work to do to make and promote the poetry of the Midwest, and Etchings makes that part of their mission. EP: Many other previous winners of the chapbook and novellas contests have focused on making diversity a major theme in their works. How do you think Uncle Harold’s… contributes to this, while still remaining true to its core message? DC: Uncle Harold’s… is a specific story about a specific family that I hope will resonate with a broad audience. Diversity happens when this formula repeats over and over again—a lot of specific stories from a lot of backgrounds and levels of privilege and ethnicities and genders all manage to find audiences, with a special focus on stories that have been historically silenced. I feel lucky that my specific story can contribute to a panopoly of voices, but I think it’s incredibly important that people read and listen to stories by people different than them. Uncle Harold’s… can only represent diversity if it’s one of many, many different voices. EP: Which poem would you say is your favorite? DC: They’re like my children! How do I pick? I like “The Inflatable Matzoh Ball of Affliction” because it was the first one I wrote. I like “The Four Sons and One God-Forbid Future Daughter-In-Law” because, at a time when I was feeling pretty doubtful about the whole thing, Mid-American Review was generous enough to publish it. I like “Dayenu” because it’s fun to read out loud, with the audience calling out “Dayenu!” at the end of every line. I like “The Seven Plagues I Could Find” because I think it’s the funniest. EP: How would you classify the genre of your poems? DC: Everything I write is basically free verse, though I have written one pantoum that I like. In this case, though, most of the poems mimic some aspect of the actual Maxwell House Haggadah (in fact, there’s a lot of found text tucked into the whole thing). So the poem about the plagues had to match the genre of…a list of plagues. On a structural scale, the chapbook follows the structure and order of the Seder (“Seder” translates to “order”), with four glasses of wine and a festive meal in the middle. EP: Have you written similar works in the past? DC: Nope. This sequence is the most formally ambitious thing I’ve ever written. I did undergrad (and started grad school) as a nonfiction prose writer, but then a poetry workshop with George Bilgere made me think I could do this poetry thing, and working with the great Phil Metres sealed the deal. EP: “Why I Didn’t Ask My Wife to Convert” was a serious ending to a more humorous collection. How do you think its message can resonate beyond the scope of the page? 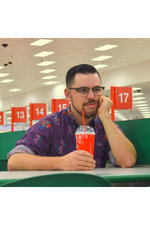 DC: It is a serious poem, yes, though the first part of it leans pretty heavily on a pun. I think any effective humor has to have some kind of truth behind it—that’s where humor gets its bite. Uncle Harold’s Maxwell House Haggadah has a “shiksa girlfriend” motif, where there’s a general distrust of Jewish men falling in love with non-Jewish women. It’s a reflection of a prejudice I’ve occasionally seen, but never, thank God, from my own family. “Why I Didn’t Ask My Wife to Convert” is my dissent against the distrust of goyim, non-tribe members. It’s a poem about acceptance and sharing—showing up in Church when your Jewish mother is baptized for the first time. Rolling with it when you fall in love with someone who isn’t Jewish. The survival of a faith that (as we’re reminded in the Seder) faces destruction every generation is important, yes, but so is acceptance and diversity. I suppose that’s how I’d like it to resonate. I should note, my actual family (as opposed to the exaggerated one depicted in the chapbook) was always amazingly tolerant of everyone, including the significant others I brought to Seders. They adore the non-Jewish person I married, and I deeply appreciate that. EP: Small presses have been around for a while now. What do you think presses like Etchings Press need to do to ensure stories like yours are being shared in the future? DC: Small presses are a great way to get diverse and adventurous writing into people’s hands. Small presses, as long as they vigorously work to promote high-quality products, will find a responsive audience. It takes a fair bit of hustle, but it’s totally worth it. EP: How can small presses make sure that authors are getting the exposure they deserve? DC: There’s a lot of work a small press can do without necessarily dumping huge amounts of money into tour budgets or advertising. If the people who work at the press really care about the product they’re promoting, they can tweet about it, and not just around the release date but in a sustained kind of way. Bookstores often like to carry small press stuff, and you can facilitate that just by bringing a couple copies in and asking to talk to the buyer. Send review copies to review editors. See if the poet will come do a reading in exchange for a free place to crash. Arrange trades with other small presses. Get a booth at local book fairs or summer festivals. Be connected and willing to work hard, and an audience should appear. EP: What advice do you have for aspiring writers? DC: Nikki Giovanni spoke here in Lawrence, Kansas last week, and she said “you are your first audience.” Don’t write anything you wouldn’t like to read. EP: What would you like readers to take away from this chapbook? DC: A family’s quirks—its grief, its desires, its inside jokes—become part of its ritual practice. Similarly, family myths and memories recur and appear every time the family reclines around the Seder table. In this way, the bag of plagues toys, the Passover Powerpoint, and the story about the year everyone only got two ice cubes are just as central to the Seder as the Haggadah. EP: If you could sum up “Uncle Harold’s…” in one word or so what would it be? EP: And finally, when can we expect a sequel to Uncle Harold’s…? 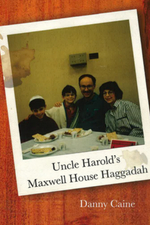 DC: Uncle Harold’s Maxwell House Haggadah is the middle section in my first full-length manuscript, which is called Continental Breakfast. The other two sections deal with similar themes, though they focus a bit more on the Midwestern landscape. The manuscript is finished and being sent out as we speak; hopefully some lovely small press will put it out! Danny Caine's poetry has appeared in Hobart, Mid-American Review, DIAGRAM, Minnesota Review, New Ohio Review and other places. He is music editor for At Length and reviews books for Los Angeles Review. Hailing from Cleveland, he lives in Lawrence, Kansas where he works at Raven Book Store.